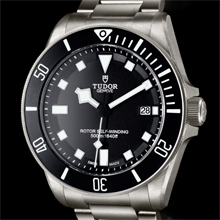 For TUDOR, 2012 is devoted to the sea. Following its chosen path, where style meets performance, the brand is presenting two major new watches this year. The Heritage Black Bay model pays tribute to the company’s rich history, with a fresh interpretation of an old standard created in the 1950s that left a lasting mark on the history of divers’ watches. The Pelagos model, which is waterproof to a depth of 500 metres (1640 feet), is a fusion of technology and innovation. Its sporting character and impeccable reliability will meet the requirements of lovers of the deep and those who are passionate about the vital marine environment. With these two models devoted to the sea, TUDOR demonstrates not just the wealth of its precious, 60-year-old heritage, but also its ability to delve into history and offer products that are completely up to date. Now more than ever, TUDOR, the icon of retro chic style, is affirming its genetic heritage, combining aesthetic power with technical virtuosity. A diving tool par excellence, the new TUDOR Pelagos is a fusion of technical mastery and mechanical reliability. It is also a proud reference to several style codes that have punctuated TUDOR’s history and left their mark on some of the company’s most iconic models. Capitalizing on this heritage, the Pelagos goes even further, inviting TUDOR to explore the silent world in a new dimension. Waterproof to a depth of 500 metres (1640 feet), this superlative watch has a case with a diameter of 42 mm. Made entirely of titanium and completely satin-finished – resulting in a special sheen and a rugged look – it is an aesthetic expression of the power of this deep-sea instrument. The case is equipped with a helium valve (necessary to absorb unpredictable variations in pressure) marked GAS ESCAPE VALVE on the side of the straight-edged case. It is enhanced by a unidirectional rotatable bezel, with a matt black ceramic disc and luminescent numerals, which is thick enough to ensure excellent grip and ease of handling. Even in extreme conditions, perfect readability is assured by generous hour markers and luminescent “snowflake” hands. An original double-bevelled flange around the dial incorporates the triangular, rectangular or square hour marker appliques – a reminder of the brand’s historical models. 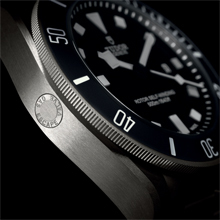 Practical, highly legible and sturdy, the Pelagos model is further distinguished by its titanium bracelet with a folding steel clasp fitted with a unique spring-loaded self-adjusting mechanism’ developed and patented by TUDOR. Thanks to this remarkable, technically accomplished system, the bracelet adjusts during diving, contracting in deep water when the diving suit is compressed and its volume is reduced, and, conversely, expanding as the pressure eases during the ascent. 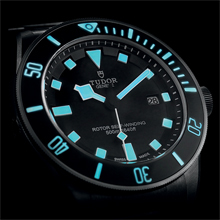 TUDOR’s Pelagos also comes on a rubber strap with an extension system enabling it to be worn easily over a diving suit. The new TUDOR Pelagos is a tribute to the sea, to those who are active in it and those who conserve it. Reliable, technically outstanding and a superlative sports model, the Pelagos – waterproof to a depth of 500 metres – marks another step forward in the illustrious history that binds TUDOR to the ocean depths.